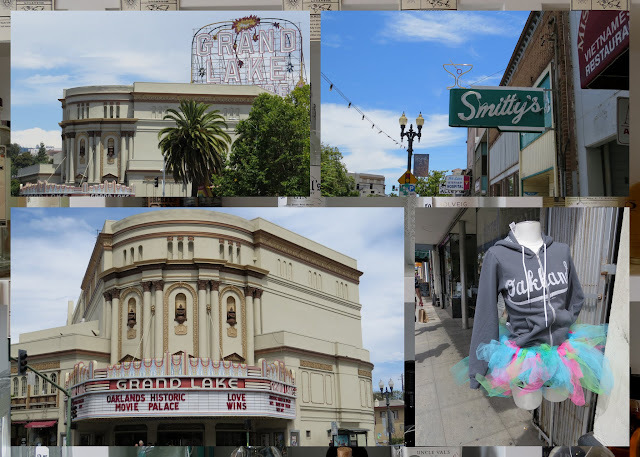 What's the first thing that comes to mind when you think of Oakland, California? I used to think of Oakland as a place to pass through without stopping, a place to be a bit wary of. Living in the shadow of San Francisco, Oakland is just a quick ferry ride across the Bay, many people don't give Oakland a second thought. We embarked on an Oakland food tour of the Grand Lake neighborhood. I'm happy to report that I now see Oakland through a new and vibrant lens thanks to See.Eat.Love. I arrived a few minutes early for our food tour and scheduled rendezvous with Raquel in the Grand Lake neighborhood of Oakland so I decided to take walk around. We discovered a sunny main street alive with shops and restaurants anchored by a gorgeous Art Deco theatre. Grand Lake seemed to have a bit of a flirty side as well as evidenced by the mannequin in tutu and hoodie below. At the appointed time, we met Raquel from See.Eat.Love. Raquel is a California native but not from Oakland per se. She's lived here for several years now with her family and has a passion for promoting the city's hidden gems. She told us about how Grand Lake in particular thrived through the 1960s until the highways were put in cutting the neighborhood off from its surroundings and leaving it in isolation. Hard times ensued but the neighborhood is now experiencing a tremendous renaissance as we would soon see for ourselves. After this bit of context and history, we were quickly on our way to a delicious (and slightly boozy...) afternoon of exploration in Grand Lake. Here's what we discovered. Our first stop was at BarLago where we laid a solid foundation in our stomachs which served us well for the rest of the afternoon. 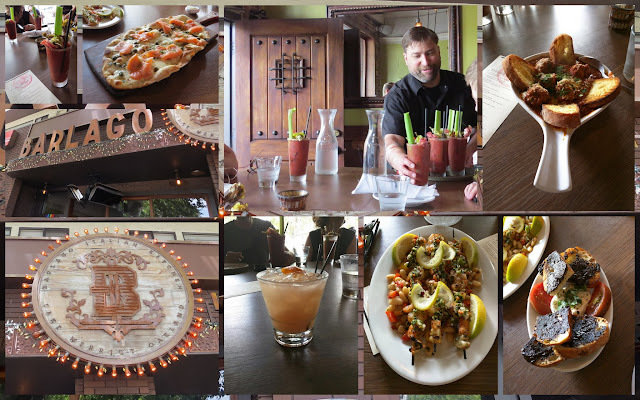 BarLago has existed in the neighborhood for years as a traditional, family style Italian restaurant. BarLago now features a sleek, modern look and feel but the menu remains true to its roots serving hearty Italian fare. We had a choice of either a Bloody Mary that could have been a meal in its own right or a Pistolero (a tequila based drink described to be similar to a margarita). I chose the Pistolero which packed a most excellent punch. We dined well on seafood skewers called spiadini ('little swords'), meatballs, bread with fresh mozzarella and tapanade, and a smoked salmon flatbread pizza. I wasn't sure I was going to last until the end of the tour at this pace! Fortunately, stop number two was strong on the senses but light on the belly. 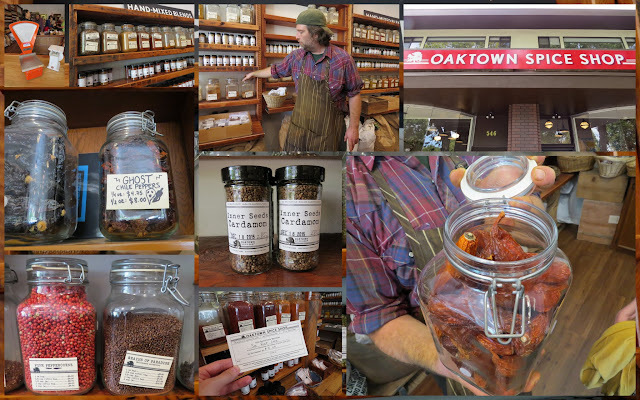 We walked into Oaktown Spice Shop where jar after jar of fragrant spices were presented to us. We were asked if there was a brave volunteer willing to sample a Szechuan peppercorn. I boldly put my hand up. Before putting the pepper in my mouth, I asked what I might expect. "Your mouth will go a bit numb." Hmm...for how long? "Up to five minutes". I was intrigued, popped the pepper and waited as the heat slowly built up in my mouth. Yum! We drew the line at sampling Ghost Peppers which feature a skull and crossbones on the jar and are one hundred times as hot as habanero peppers. The store can't stock it ground (e.g., whole chilies only) as it could present a safety hazard to customers if the jar was opened or sampled. We spent some time browsing the shelves and were even given a $5 gift card to spend in the store so I was able to take home some peppercorns and chilies as a memory of our visit. Our next step was just a couple blocks away, past the enormous farmers' market that anchors Grand Lake on a Saturday. We soon stood in front of a sleek glass window and went inside to find all sorts of potable potions. 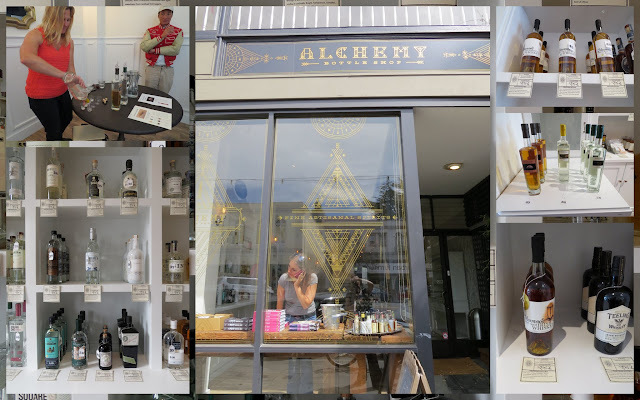 Alchemy is a boutique bottle shop that sells craft bottles of gin, whisk(e)y and other spirits. We were ushered to the back of the store for a craft gin tasting. We sampled three different styles of gin from Russell Henry. I'm used to drinking gin in cocktails but never straight. These spirits each had subtle notes like white ginger and Malaysian lime. Another $5 gift card was tucked into each of our hands. I used the opportunity to buy a bottle of American whiskey aged in a sour ale barrel to bring home to my whiskey loving colleagues in Ireland. Loved this shop! 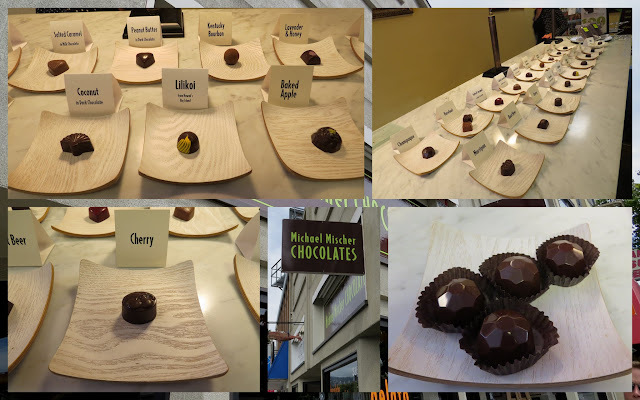 We retired just down the block to Michael Mischer, a chocolatier with roots in Germany and Switzerland. Michael Mischer was one of the first shops to open in Grand Lake and jumpstarted revitalization of the neighborhood. We sampled champagne truffles and our mouth watered as we perused the more exotic flavors on display. Sweet tooth sated, we continued next door to Ordinaire, a wine bar with a fantastic vibe. We sampled four or five wines (I lost count...) from Fellom Ranch. We were also treated to a charcuterie plate filled with artisan cheese and meats from across America (prosciutto from Iowa anyone?). Bellies full, a smile on our faces, and admittedly with a mild buzz from the more boozy stops, we bid farewell to Raquel; a new image of Oakland as an entertainment and foodie destination firmly taking shape in our minds. 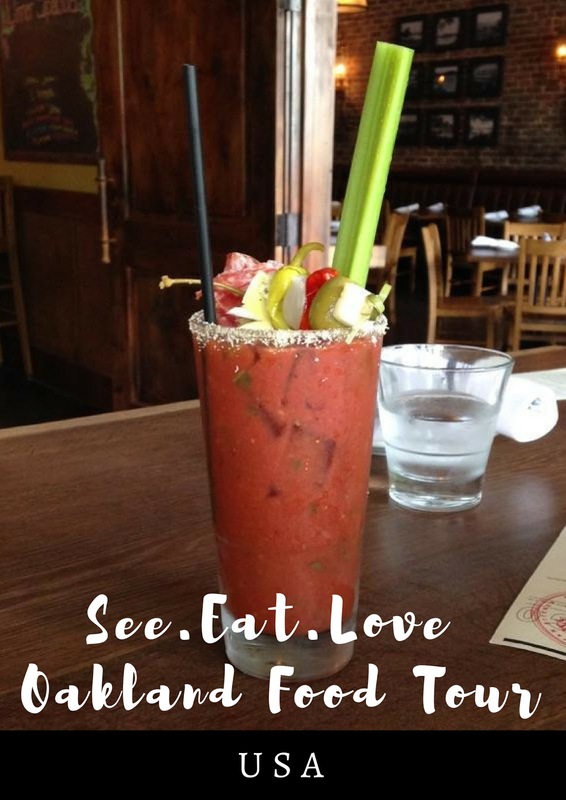 Details: See.Eat.Love offers food tours of five different Oakland neighborhoods on a monthly basis on Saturday afternoons and also offers private tours. Tours cost $65 - $75. Disclaimer: See.Eat.Love sponsored a private food tour of Grand Lake for me and five friends. However, opinions expressed in this article are my own. 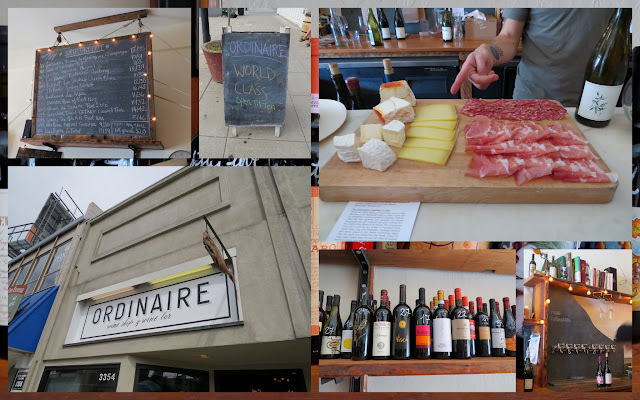 Review and photos from the See.Eat.Love Oakland food tour of the Grand Lake neighborhood.